Classes of products that can be analyzed to obtain the certificate. The more intense the contact of a textile product with the skin (and the more sensitive the skin), the greater the human-ecological requirements to be met. Textile products and textile toys for babies and small children up to three years old, p. ex. underwear, jumpsuits, bedding, bedding products, stuffed animals, etc. 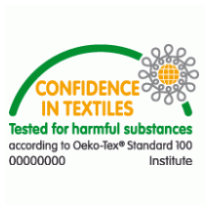 Textile products, which during use according to their purpose do not come in contact with the skin or do so with a minimum part of its surface, eg. ex. jackets, coats, stuffing materials, etc. Accessory and decoration materials such as tablecloths, curtains, but also for covering the floor and walls, etc.